In her experience, people have either never heard of furries or they have a wildly distorted idea of it. 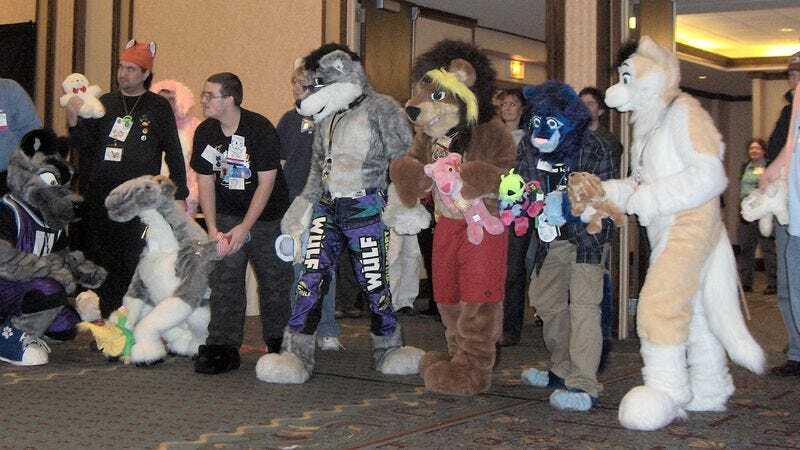 As a result, fur fandom have become far more stigmatized than other similar nerd niches, such as anime and cosplay. According to master fursuit maker Sarah Dee, it’s about getting an opportunity to escape from the responsibilities of everyday life. To this day, Dee has brought more than 300 “fursonas” (furry personas) to life—including Baltoro the Fox, realistic with taxidermy eyes, hand-molded silicon paws and muzzle and digitigrade hind legs; Zeke the Hyena, cartoonish with hand-stitched stripes and airbrushed abs; and Blaze, a vixen with flirty eyelashes and curvaceously padded chest. Dee’s costumes though, are no joke. They can take up to 200 hours of work, and cost thousands of dollars. If you want a costume from her, you can expect delivery at some point in early 2017; she’s already booked up for this year. She adds that, like everything else, the furry community has its own trends. One year it’s neon colours, the next grumpy-looking characters. One season, everyone wanted to be a sled dog. It’s all, of course, about the fur—even sharks, reptiles and birds are adorably fuzzy—and Los Angeles’s fashion district has stores devoted exclusively to hundreds of varieties. Even today, Dee, who quit her advertising job in Denver in 2012 for full-time fursuit making, doesn’t use her real name for business. She recalls last year’s suspected hate crime at Midwest Furfest in Chicago, which was evacuated after chlorine gas was leaked into the conference venue. Last year, she came across Facebook posts of people claiming they would bring guns to Anthrocon, the world’s largest furry convention, and personally alerted FBI. The whole article is over at The Guardian, and is full of fun, furry tidbits like those above.